Window Quilt Insulated Shades qualify for the 30% (up to $1500) tax credit. Shades must be purchased and installed by December 31, 2010. Start saving money this heating season by installing your shades now. Email or call the Shelter Institute for more information on the tax credit, sizing, price and installation of shades. We have units in use installed in our facility as well as floor samples to touch. Please stop in to see Window Quilt in action! If your still not sure which window treatment is best for your home, budget and application join us for a free workshop to learn more about your options, heat loss and insulation. The federal government's "First-Time Home Buyers" tax credit expires on Nov. 30. The current offer is a tax credit for 10% of the purchase price of a property, up to $8,000. First-time home buyers doesn't just mean young people buying their first home -- this term applies to anyone who has not owned a principal residence during the three-year period prior to the date of purchase. For married taxpayers, the law tests the homeownership history of both the home buyer and his/her spouse. First time home buyers are flooding the market and creating a flurry of showings and activity in the real estate world. Mortgage approvals, residential inspections, and other steps in the buying process typically take about two months, buyers hoping to take advantage of the incentive will need to have a contract by the end of September at the latest. Those of you planning to take advantage of this tax credit at the last minute should be aware that mortgage approvals are currently taking longer than normal because home Appraisals have been placing very different values on homes than the buyer and seller agree to and for which the buyer tries to get financing. This is not an issue when the appraisal is too high but can bring the transaction to a screeching hault when the appraisal is too low. What can you do? If you find yourself in a transaction where the appraisal has devalued your house or your perspective house, find out why. Ask for a full copy of the report and information on any comperables that were used. Be sure to point out any features of a property that would enhance the value and consider requesting a new appraisal. In many cases Appraisers are using other recent local sales to provide a benchmark value for your own property. The problem with this in the current market condition is that some of those comps may be Short Sales and/or Foreclosures meaning that the circumstances under which they were sold were perhaps different from the circumstances in which you are trying to sell or buy. What are current market conditions? What dollar value does the buyer place on the property? What dollar value does the seller place on the property? Remember that you can seek alternate sources of finance. Remember to shop for your financing and in doing so you may find that the appraisal value is not as important. The foreclosures and short sales are bringing values of homes down but that doesn’t mean that the value of your home has to change. Join us for an open house at this home in Dresden. As the heating season approaches, those of us living in colder climates are looking around our homes for last-minute improvements that we can make in order to stay as warm as possible with as little energy as possible. An obvious heat loss is through the glass in our windows. 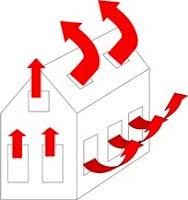 Regardless of how tight your windows are there is still considerable heat loss. Insulated shades have been available for more than thirty years but this year they are becoming so mainstream that you can purchase them everywhere from specialty stores where they are custom made for your windows to online sources and big box stores. You can imagine that there is considerable variety in the quality, r-value, and options available. This one-hour workshop will explain the science around insulated shades and explore the options, pros, and cons of various shades. You'll leave knowing what option is best for your home and your budget. This beautiful 7-acre parcel has just had a price reduction to $65,900! It is the last lot in the subdivision, on cul-de-sac, connects to miles of wooded trails for skiing and hiking. Private and remote location with easy access to the midcoast region and the rich culture it has to offer. Rights to association moorings available in deepwater Kennebec River just a mile away. Please call 207-443-9905 or email for more information. 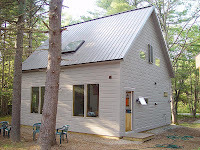 We install metal roofing exclusively on our timber frame shells. With warranties up to 45 years on the finish, ability to recycle, wide range of color options, longevity, ability to reflect the sun’s heat and shed snow and, this year, available tax credit, the advantages of metal roof are obvious. We are typically installing the metal roof long before the plumber has had a chance to run the main vent stack up through the roof, and this part of the job seems to create a fair amount of (undue) anxiety for both the plumber and the homeowner. I recently had the opportunity to install a couple of vent stacks through a metal roof for past clients and thought ‘What a great blog this would make!’ Here is my technique. As with most of our shells, the timber frame was enclosed with SIP (structural insulated panel) walls and roof. This makes the installation even easier since there is no framing lumber in the roof to avoid. I use a slow turning right angle drill and a hole saw with an extension to drill up through the SIP and metal roof all in one clean shot. For this particular job, the plumbing had been run up to within a few feet of the roof panels. Using a plumb bob, I transferred the centerline of the pipe up to the ceiling and placed a mark there. The hole saw has a pilot drill making it easy to center the hole on my mark. I choose a hole saw that is just large enough to allow the pipe to pass through (photo 1). A hole that is much larger than the pipe is more likely to allow warm moist air inside the building to come into contact with the underside of the cold metal roof, condense and drip back into the building, making the roof penetration appear to leak. I also like to seal the PVC to the metal roof as additional insurance against leakage which is only possible with a snug fitting penetration (see photo 2). It is convenient to have a helper with a well calibrated eye stand back and make sure your drill remains plumb as you drill up through the roof. This house had a 9” thick SIP on a 5/12 pitch making the hole about 10” in length-plenty of room to get out of plumb. The pipe that will get installed through the roof is schedule 40 PVC and quite rigid. If the hole you drill is far out of plumb it can be quite difficult to align to the existing plumbing and make the pipe look crooked from outside. After the hole is drilled, measure from the existing plumbing up through the hole to determine how much pipe is needed to make it through the roof, then add 12-24” of length to ensure that snow does not build up against and plug the vent stack. If the International Plumbing Code is enforced in your area, Section 904.1 calls out the minimum roof extension distance for your zone. I feel compelled to mention that the IPC also stipulates that “vent terminals shall not be used as a flag pole or to support flag poles, or similar items,……”. No further comment needed. After gluing the pipe in place with the appropriate primer and glue, it is time to head up onto the roof. For this job, the roof is a 5/12 pitch and it is possible to walk on the roof, when dry, with no staging or scaffolding needed. I do have several words of caution though. In the spring, a layer of yellow Pine pollen can build up on the roof making it quite slippery, so try to plan the roof trip after a rain. Stepping on the screw heads affords extra friction and avoids the ‘little slips’ that can give you a heart attack. Remember that OSHA requires some form of fall protection, for good reason, when over 6’ off the ground. For clarity, we have Photoshopped the scaffolding out of the accompanying photos. We use an EPDM (Ethylene Propylene Diene Monomer) flashing boot known as a Dektite, for plumbing stack and all other ‘cold’ penetrations. For penetrations, such as single wall chimney pipes, where extended, elevated temperatures are inevitable, use the silicone Dektite. These are both available in a wide range of sizes, and can be trimmed to fit the exact pipe diameter. Be extremely careful when trimming the Dektite because a tight fit between the Dektite and the pipe is a critical part of a long term, leak-free installation (photo 3). I use a sharp utility knife, but only because I sharpen my blades out of the package on my Tormek T-7 professional sharpening system (available at Woodbutcher Tools and, of course, on our website), and I have a dead steady hand. A lack of either of these can lead to an errant slice in the Dektite, rendering it useless. Notice that the Dektite I am installing here has a round base that sits on the roof surface (photo 4); this works well up to a 7/12 pitch. For steeper roofs, a Dektite with a square base works better, with one corner of the base aimed up the roof, toward the ridge. After trimming the Dektite along the appropriate score line provided, I test fit the boot. The base has a piece of aluminum adhered to the EPDM which allows you to bend the base to fit the roof profile. When I am happy with the fit, I pull the Dektite off and apply a healthy bead of 100% silicone sealant (a marine adhesive like 3M’s PL 5200 also works very well, though is more expensive and often difficult to find) to the interface of the metal roof and the PVC (photo 5), this is the final line of defense against leakage, but should never see moisture, theoretically. Notice in photo 5 that a roofing screw has been removed, and the Dektite will end up partially straddling a rib. The screw was removed to allow the Dektite base to fit tight against the roof; the boot is straddling the rib because of Murphy’s Law. Next I apply a thick bead of silicone sealant, using my professional grade Tajima caulking gun, to the flat underside of the Dektite (photo 6), and slide it down over the pipe. Just before contacting the metal roof with the silicone, I double check that the boot is oriented properly to take advantage of the pre-fit work: I want the boot to slide straight down and have the excess silicone squeeze out without rotating, as this can allow air pockets to form in the silicone which can leak. To attach the boot to the roof I use 7/8” long Tek screws. These have a pre-drilling tip which makes it easy to drill through the aluminum base and the metal roof. These screws get installed about 1” on center (photo 7) all around the base and will hold the silicone gasket captive as well as preventing sliding snow from breaking the waterproof bond between the Dektite and the metal roof. It should take about as long to install the Dektite as it does to read this verbose article. On roof pitches above a 7/12, it is wise to consider additional snow slide prevention. There are two typical devices. One is a plastic ‘block’ with a self-adhesive membrane. These should be placed every 3-4 feet up the roof to within 3-4’ of the ridge. Be aware that these will only fully adhere with continued temperatures above 45 degrees Fahrenheit. The other device screws to the roof and ties to the vent pipe with a stainless steel band. The metal plate that screws to the roof deck is shaped like a ‘V’ to help part the sliding snow around the pipe as it comes down the roof. Lastly, the hole in the roof inside the building should be properly sealed to prevent warm moist air inside the building from coming into contact with the cold underside of the metal roof. A bead of 100% silicone between the pipe and the drywall ceiling works well if the gap is around 1/8” or less. If the hole was drilled larger, you should instead place expanding foam all around the pipe to prevent air migration. It should take about as long to install the Dektite as it does to read this verbose article. The 2009 Stimulus Package provides substantial tax credits to homeowners who make energy efficient updates to their home. A great way to qualify for the credit is installation of a painted or coated Energy Star® labeled metal roof. Homeowners installing qualified roofs in 2009 and 2010 may be eligible for a tax credit worth up to 30% of the materials cost (materials only) up to $1,500 per home. 1. Find a Contractor or supplier near you to discuss a new metal roof for your home. 2. Confirm that the metal roof you select is a painted or coated Energy Star-labeled metal roof and obtain certification. 3. Purchase and install the metal roof between January 1, 2009 and December 31, 2010. 4. Fill out IRS Form 5965 when filing your taxes for 2009 and/or 2010. Join us for a class on energy efficient housebuilding. Our 2010 class schedule is now available on our website. Check out the Design Build Class with all of the topics from solar angles to engineering to wiring and plumbing. The Small Housebuilding Class offers hands-on construction and techniques building a 12x16 structure installing windows, doors and roofing. Learn the art of timber framing in a one week Purely Post & Beam class. Classes qualify for general course credits through the University of Maine in Augusta and VA reimbursements. Take all three classes and receive a ten percent discount on the tuition of all three when you take the final class. Join the thousands of energy concious thinking people who plan well, to build well to live well!